You are here: Home / Den Talk / UPDATE: Foley NOT back with Lions, signs with Argos. UPDATE: Foley NOT back with Lions, signs with Argos. UPDATE: Since last night Ricky Foley apparenly decided to sign with the Lions, then the Argos, then the Lions again and finally signed with the Argos this afternoon after coming on Vancouver radio station TEAM 1040 and “comfirming” to Lions fans (43:01 into the podcast) he was coming to BC. Mr. Foley, thank you for blowing smoke up the asses of BC Lions fans. The BC Lions football club announced the signing of free agent Canadian defensive lineman Ricky Foley on Monday. As per club policy no terms of the deal were released,but it’s safe to say that Ricky Foley received a nice raise upon his return the to CFL. 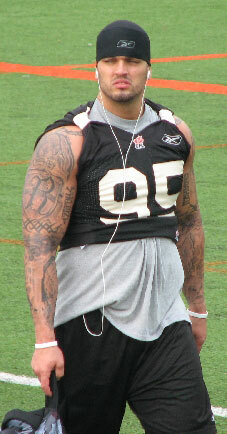 Foley was the league’s top Canadian in 2009, racking up 12 sacks (leading the league) and 51 tackles. He left the club this offseason and signed with the Seattle Seahawks as well as the NY Jets before returning to the Lions, where he won a Grey Cup in 2006. Foley’s non-import status will give the Lions more ratio options to address other areas on the club. With Foley knowing the Lions system, it’s quite likely he could see action Saturday versus Hamilton.